Another set of *adjustable railings. The 'Railing Section' prop has four simple morphs to adjust the slope and curve of the rails, and is intended for adding railings quickly to a scene. The 'Rail Only' prop is intended for joining multiple 'Railing Section' props together. To fit railings more precisely to a scene use multiple 'Pillar And Rails' props. The prop has Rail Adjustment morphs to allow the endpoints of the rails to be moved around in X/Y/Z as a group or individually, and connected to another pillar. More info in the readme). The 'Pillar Only' prop is intended to terminate a series of 'Pillar And Rails' props. The Single Rail prop is specifically for people who find the Rail Adjustment morphs too awkward. It's intended to be used with, and parented to, a 'Pillar Only' prop. More info in the readme. There are no texture images in this package (although everything is UV mapped and there's a texture template included). 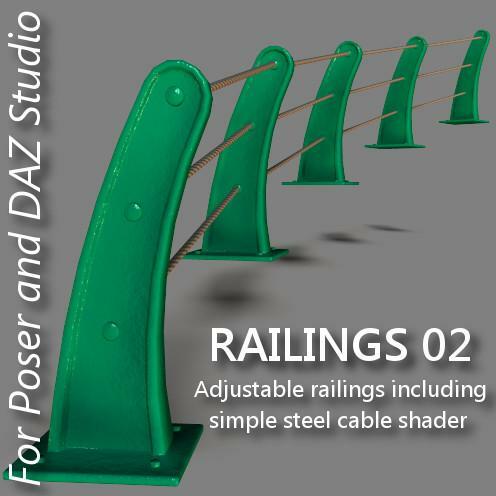 The default texture uses two procedural shaders (both Poser and DAZ Studio versions) - repainted green for the pillar and steel cable for the rails. Please note: the effect of the steel cable shader is very dependant on lighting and distance and WILL require fiddling around to get it to look good. See readme for ideas. I'll be adding more information and images to this page over the weekend. If you download before them please check out the readme as there's some useful information in there. 3DCheapskate (7 months ago) Inappropriate? I don't have DS4.10, butI just checked in DS4.9 (3Delight) and it renders fine. I could not get the materials to work in Daz Studio 4.10. I got the materials to work for the Railings 01 by following the instructions. But here, with Railings 02, the instructions fail me. Cool model regardless. I'll just be using my own materials/shaders. As excellent as Part 1. Thank you very much! Another great set, thank you.